The Lorax had already been adapted for television as a half-hour special in 1972. A full forty years later, the Dr. Seuss short story gets a feature-length treatment. Even among the neophytes who see Theodor Seuss Geisel as this warm and cuddly little old man who writes cute children's stories, the environmental message of The Lorax is thoroughly and overtly clear (STOP DESTROYING TREES AND NATURE FOR EVIL PROFIT). The question for the film version of The Lorax is whether a story this short and obvious could be lengthened without it coming off as propaganda. The beautiful animation lifts The Lorax past the weak songs and stretched out story. Ted (Zac Efron) is in love with the girl not-quite-next-door Audrey (Taylor Swift). The one thing Audrey wants more than anything is to see a tree, a real tree. However, in Thneedville, there is no such thing as a tree. All the trees in Thneedville are plastic, and that's the way the citizens like it. They like their imported, bottled air and their plastic world (in fact, they sing about it). Ted, being a typical guy, is going to get a tree for Audrey. With a little help from Gammy (The Betty White), Ted manages to leave Thneedville to find the Once-ler (Ed Helms), who knows what happens to the trees. The Once-ler tells Ted bits of his story. He came to the valley long, long ago, where the place was filled with Humming Fish, Swomme Swans, and cute Bar-Ba-Loots bears. In his eagerness to make some cash, he cuts down a Truffula Tree (not to be confused for Ruffalo Trees, which are trees belonging to Mark Ruffalo). The chopping of the Truffula Tree brings out the Lorax (Danny DeVito), who speaks for the trees. He warns the Once-ler that cutting down the trees has terrible consequences. The Once-ler is dismissive of the Lorax's concern, and most of The Lorax is spent with him trying to get rid of the Once-ler and stop his industrialization. However, the Once-ler brings his hick family to the valley, and as he grows greedier the once-lush valley is decimated beyond repair. Once the Once-ler finishes his story, he gives Ted the last Truffula seed. With that, Ted goes back to both plant it (having been inspired to bring nature back) and to still impress Audrey. From there, The Lorax turns into a chase, with evil industrialist (is there really any other kind) Mr. O'Hare (Rob Riggle), the man who sells the air, trying to stop the planting of the tree (since trees provide free air). The Lorax stays true to the spirit of the book (it even manages some of the Seussian rhyming patterns) and it sticks to the story. However, the source material would not support even the relatively short 86 minute feature, so we have two stories added: the romance angle between Ted and Audrey, and the evil O'Hare. I would argue that the former worked, the latter didn't. In regards to the romance, the Once-ler spoke truth, "When a guy does something stupid once, well it's because he's a guy. When he does something stupid twice, it's to impress a girl". Truer words were never spoken. The O'Hare subplot, however, fails to mirror the Once-ler's tragedy and appears to only be there to give Ted an antagonist to fight against in the last act. That, and the fact that O'Hare looks like Edna Mode from The Incredibles in drag did not help. Cinco Paul and Ken Daurio's adaptation of Seuss' story granted needed to put in more, but I would have like a greater emphasis on the Ted/Audrey story and less on O'Hare. Perhaps the general fear of trees among the population would have been enough. One big flaw in The Lorax is in the music. A good animated film should have at least one showstopping musical number, and The Lorax's music, while cute, is not memorable. After watching, I cannot recall one song that I left humming to. The songs, or rather the impression that I get (hope you get the reference) from the songs are more horrifying than endearing. The big opening number is a song celebrating the willful ignorance and delight the Thneedville residents have in not having real trees or breathable air. Talk about subtlety of a hammer. Also connected somewhat to music is how the Once-ler's family is introduced: with them in an RV barreling into the forest while the first twelve of Dixie played. Maybe it was an homage to The Dukes of Hazzard (a personal favorite) but couple that with the the dim-witted (and accented) twins and it looks like The Lorax has either contempt for or a certain idea that "Southerners" willingly would destroy the Earth for cash. However, I found The Lorax to have been beautifully animated with great voice-work by Efron and The Betty White; Helms and Swift were better than I expected and DeVito was great in both his frustration and his almost chummy interaction with the Once-ler. I figure The Lorax had to be stretched out and throw in some good 3-D moments (which made it look like a theme park ride I for one would like to go on) and I can't fault it for that. 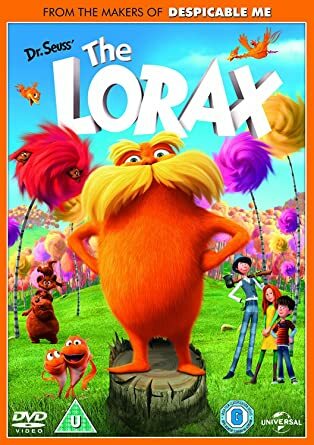 Minus the O'Hare subplot that was almost fascist in how he ruled Thneedville and songs that won't stick in the head The Lorax is a delightful film that teaches (albeit a Truffula one-sided) the importance of preserving the Earth's resources. There must be a balance between industry and environment. Neither are all evil or all good. Kids will love the animation and cute characters, adults will appreciate the message, and everyone will think well of The Lorax. This Green Should Be Seen. I'm partial to Swomme-Swans myself.